A freeform peyote bracelet is part and parcel of an organic peyote bracelet. In my mind, an organic is always freeform, but a freeform is not always organic. I know, seems to be very little distinction, but in my mind there is. What I term “organic” is more than just free-form. It’s also adding other elements, like lampwork for example (see my sculptural peyote bracelet post). Free form is mixing sizes of beads, as well as textures, which gives the work a little more excitement than straight peyote beading. Here’s a bracelet I just made this week. It’s the standard peyote stich, but because I used 3 different sizes of seed beads, it has a texture, as well as a wave form. Fireline, smoke color, 6 lb. Seed beads in sizes 15 (gold), 11 (reddish-burgundy) and 8 (matte rainbow red). Using an even-count peyote with 8 beads, I started off with the size 11 in a standard 1-drop peyote stitch, which I gradually transitioned to a single-drop size 8, which started the wave form. After the size 8, I then transitioned to a 2-drop size 15 seed bead. A 2-drop size 15 is roughly the same width as a 1-drop size 8, so while the width of the bracelet more-less remained the same, the texture and appearance changed. I followed the 2-drop size 15 with a 1-drop size 11, which started another wave, since the bracelet width appeared to decrease, although I am still using the same 8-bead width. I followed with the size 8 single-drop followed by size 15 2-drop, and then back to size 11 single drop. That’s it! The three different sizes and textures, along with the gradual transition from one size to the other makes it free-form. For finishing, I sewed a button on one end, and created a loop at the other end. I like my bracelets to not have a large gap between the two ends when I wear it, so I didn’t put the button at the very end. Instead, I put it inward, with several rows of beading visible beyond the button. This of course is entirely optional. I’m not listing exactly how many beads I used, seeing as it will depend on if you are using donut-shaped seed beads or tube-shaped seed beads. It also depends on how you want to transition your beads. You see, I never know exactly how many beads I will end up using, because most of my free-form designs “mutate” as I go. So instead of grams, I judge by how many inches I use of my tube of beads. I buy mine in 6-inch tubes, and I can tell you I used about 2 inches of the size 8, an inch of size 11 and a tiny bit (maybe 3/8 inch) of size 15. I used Fireline, but you could of course use something else — check my beading threads post for other options. The bracelet is just shy of 8 inches, including the loop (I like to wear my bracelets quite loose). Naturally your size may vary depending on your wrist size. And of course the colors are up to you! I used this pallet which goes with a lot of the colors I wear (purples, violets, rose, muted fuschia). I could just as easily have selected blues, greens or other colors. I may even try it with some bright contrasting colors, like purple, green and orange (that might be, um, interesting). You could even use completely different colors for each size, making a kind of rainbow effect. In other words, your imagination is the only thing holding you back. I have a sculptural peyote bracelet to show you, and believe it or not, a lot of it is made with a circular peyote stitch. And of course some regular flat peyote, both odd and even count. I started with seven circular peyote disks, which I sewed together. The middle disk I did some decreases at the edge so that it would cup some, so as to be a good place to put my focal lampwork bead (which I made myself). Once all the disks were joined together, I started my sculptural work. 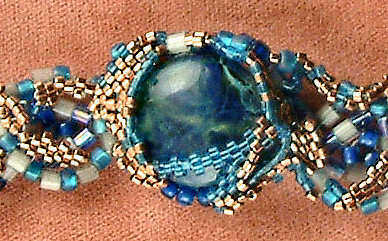 The base of the bracelet was made in size 8 tube and seed beads, in shades of blue and gray. So, for my sculptural accents, I decided to go with copper-colored metallic Delicas and some transparent blue Delicas. The reasoning behind the Delicas is that they would provide a nice contrast to the size 8 beads. And because they are so even, they fit together wonderfully well in a peyote stitch. It’s really hard to teach sculptural/freeform peyote unless it’s done in person, but I’m working on a tutorial in ebook form. The idea is to take a basic shape and turn it into something truly unique. And have lots of fun doing it! 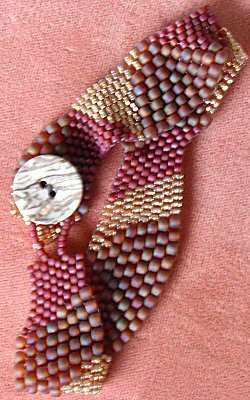 But in the meanwhile, you can see that the basics involve working peyote stitch over the existing bracelet. And while in this case I didn’t include any other beads other than the focal and the seed beads, many times I’ll create one with Swarovski or additional lampwork beads. And when it comes to playing with freeform peyote, the sky is the limit! There really is no “right” or “wrong” — just what appeals to you! Well, let me go and work on the ebook some. Meanwhile, if you’re wanting to include some lampwork in your own free form peyote, here are some options for you. Til next time!